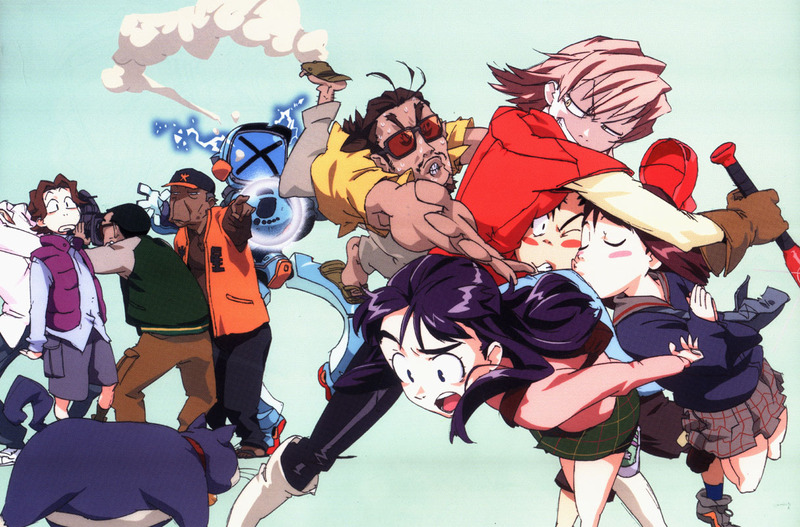 With day three, FUNimation returns to anime and a license rescue, this time of the six-episode wacky OVA series FLCL, aka: Fooly Cooly. One of the things that surprised me as I read the announcement is that FUNimation scored the license from Production I.G and not GAINAX. When Synch-Point had the license, the Production I.G aspect of the production was not discussed very much if at all. The GAINAX angle however was heavily discussed. Now I see that Production I.G apparently played a role in producing the English version of the anime. I hadn’t realized but then again, I’d never bothered to even look before. Regarding the dub, people have been asking if FUNimation would redub it or not. FUNimation made this announcement on Twitter. FLCL has been dubbed before and we think it’s awesome. As soon as I know for sure if we will go with the old dub or new, you guys will know. nothing [sic] wrong with FLCL dub – just don’t want to give a definitive answer until I know for sure….give me 24 hrs, folks. I’m guessing they’ll go with the original dub, which is pretty good. New this morning: We WILL be releasing FLCL with the Synch-Point dub. So, if you haven’t seen this nutty anime, it might be worth your time if you like crazy comedy stuff. You like a dub? Never thought I’d hear the like. As Otaku Review said regarding this license, “It was a good day.” I will be buying this on Blu-ray. Very nice. The original Synch-Point release was difficult to find even when it just came out. It is nice that people can hear what was Kari Wahlgren’s very FIRST dub role in anime…EVER.